There's not a better way to welcome Spring than at the Kite Festival! Bring your own kite or buy one here. Plan to spend the day flying kites, shopping local vendors, eating great food and listening to great entertainment. Soaring kites! Colorful kites! Majestic kites! Come join this free, fun, family event. 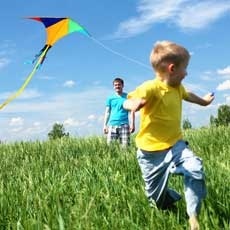 Whether you're flying or watching kites, get outside with your family and enjoy all of the exciting outdoor activities the festival has to offer!